Frances, happily married for many years, and suddenly plunged into mourning. Her international celebrity husband Steve has died leaving her unprepared and vulnerable. At first she is completely submerged in her own loss until, shocked into feeling by the unexpected revelations and private sufferings of others, she is drawn agonizingly into new life – not into perfect happiness but into the sunlight of new hope. Penelope Lively’s moving and beautifully observed novel illuminates two terrifying taboos of the twentieth-century – death and grief. "PERFECT HAPPINESS is Penelope Lively’s best novel to date." 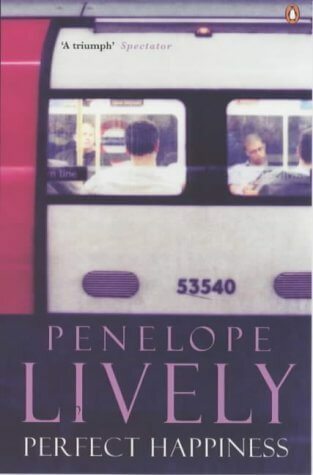 "Penelope Lively has created characters in whose reality we believe and about whose fortunes we care. In very tricky terrain for a novelist she never puts a foot wrong." "Although about pain, it is a pleasure to read, so wise it is on the depth of feeling and abiding of love." "This short, intense novel is beautifully written, expressing difficult emotions and thoughts with perfect grace. But it is not in the least ethereal. It has a good share of down-to-earth characters, seductions and revelations."